Kevin Long's first league goal for the Clarets has been a long time coming but the Irish defender is delighted that the breakthrough has arrived at a vital moment. The Cork-born 27-year-old, in his eighth full season with the club, had to wait until his 36th appearance, his 15th in the top flight, to open his account as Burnley beat Leicester City at Turf Moor. Long, who netted in a 4-3 defeat to Southampton in the FA Cup at St Mary's just over four years ago, towered above Harry Maguire to power home Johann Berg Gudmundsson's corner to double the home side's lead before the 10-minute mark had been reached. That goal all but sealed seventh spot for the Clarets in their bid to qualify for the Europa League while Newcastle United's win over Arsenal at St James's Park means that Sean Dyche's side are just two points shy of breaking in to the Premier League's top six. "Yeah, it was a massive three points for us," he said. "We knew coming into the game that Leicester were behind us in the league and chasing that European spot so we knew it was going to be a massive game, and to get the three points is fantastic. "I’m delighted. We worked on it [corner routine] on the training ground during the week. Thankfully the set-piece came off for us. For it to come off and get your rewards is fantastic. "You don’t want to score and be on the losing side, so to score in a massive game like this and win was brilliant." 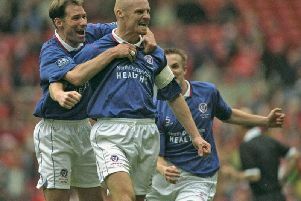 Long spent a brief period on loan with Portsmouth four years after the club had enjoyed one of their greatest moments in their history. After beating Portuguese outfit Vitoria Guimaraes 4-2 on aggregate in the qualifying round of the UEFA Cup, Fratton Park would stage European football against Italian giants AC Milan, armed with the likes of Gennaro Gattuso, Clarence Seedorf, Kaka, Filippo Inzaghi, Andriy Shevchenko and Ronaldinho. And that's the stage that Long wants to be competing on. "It would be massive," said the centre back. "Every footballer wants to play at the highest level, and if you’re playing European football, you’re going to be doing that. "And for the fans, you could hear them at the end. The atmosphere was brilliant. They’re all dreaming of European football, so we hope we can get that for them. "Everyone wants to be playing at the highest level. That’s what you’re waiting for as a young lad coming into football. "You want to be playing at the highest level. If you’re in the Premier League and in European football, it’s fantastic."